In the all London derby Brentford consigned Millwall to a one nil defeat at Griffin Park aided and abetted by a missed Lee Gregory penalty with ten minutes left on the clock. Brentford’s Romaine Sawyers early second half goal was enough to ensure Brentford move out of the bottom four and sees Millwall slide down two positions to 16th in the Championship league table. Daniel Bentley in the Brentford goal was in devastating form to keep a clean sheet and shut out Millwall as a crowd of 9,622 witnessed the home team keep almost two thirds of the possession and yet Millwall still managed 19 attempts at goal. However Bees midfielder Romaine Sawyers smashed Henrik Dalsgaard’s pass with a close range shot to beat Millwall keeper Jordan Archer just two minutes into the second half to grab his first goal of the season and grab three points for the home team. Incredibly Brentford’s home form has been so poor that this was their first home victory in 8 matches. From the off though, it was Millwall who showed more purpose. They went close after 10 minutes when Lee Gregory raced away from the halfway line following an Andreas Bjelland error, but his low angled drive bounced inches wide after a deflection off Brentford captain John Egan. The unmarked Jake Cooper should have put the Lions ahead from the ensuing corner, with only a point-blank block from Bentley keeping things level. Nico Yennaris was first to try a shot for the hosts but his first-time effort flew well wide midway through the first half. Brentford youngster Ollie Watkins was at the heart of most of the more direct work for Dean Smith’s side, and he clipped a clever shot just over the bar minutes later. Brentford were dominating possession and playing all the football but Millwall were not thwarted and always looked a threat on the counter attack, with many a long ball up to the lonesome Gregory. Though Brentford had a couple of half chances they were lacking in conviction and their London neighbours almost made the hosts pay when Wallace’s superb free-kick dinked over the wall, only to find Bentley at fell stretch. After the break, the game exploded into life and again Bentley pulled off a sensational save to deny Shane Ferguson before Brentford excellent substitute Lasse Vibe (was he a dog toy in a former life?) forced a reflex stop from Archer between the Millwall sticks. At the other end Bentley was in scintillating form and with 20 minutes to go he hurled himself sideways to tip a Gregory piledriver around the post. 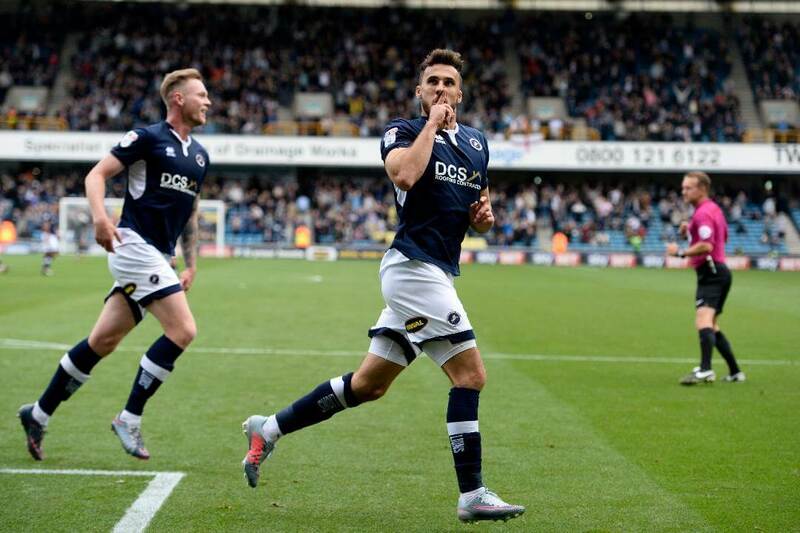 Just as Millwall appeared to have been given a lifeline Lee Gregory let Brentford off the hook in controversial fashion. With just 10 minutes to play Jed Wallace was fouled in the box and Gregory rifled home the loose ball only for referee Lee Probert to stop play and award a spot-kick. Gregory stepped up but his well-placed penalty was pushed wide by Bentley, who capped a superb performance with the Man Of The Match award. “I’m not even sure it was a foul, let alone inside the box. If it was in the box it was offside anyway, but there were a lot of decisions that raised eyebrows. When you play against a side as physical and aggressive as Millwall you need some protection and you expect some degree of consistency. Millwall were fairly physical it has to be said but it was Brentford who committed more fouls than Millwall with 13 to the visitors 10. “Don’t get me wrong, Brentford had a lot of chances in a very open game, but the key decisions went against us. “After the break their centre-back punches the ball in the box and then one of their lads stands on Shaun Hutchinson’s foot in the area.